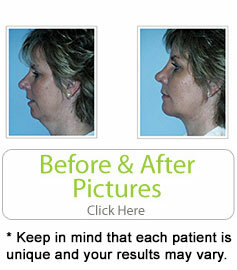 About the Procedure Chin implant surgery is a procedure designed to change the size and shape of the chin. This procedure is generally performed on persons with receding chins, or those who desire a stronger profile. Candidates must be in good health, with healthy bone tissue and normal jaw function. This procedure is performed by placing patients under anesthesia – either local or general – and inserting an implant into the chin. This implant can be placed through a small incision under the chin or inside the mouth. After the implant is properly placed, the incision is closed with stitches. If the incision site was under the chin, it will be dressed and the patient will be wrapped to avoid movement of the implant during healing. The entire procedure is simple, and when performed without additional procedures takes less than one hour. Most patients are mildly active again the same evening of the surgery. Recovery Chin implant surgery has a recovery time of approximately one week. Patients are generally able to maintain light activity during that week, but will notice some post-operative tightness and swelling. Patients may also notice some tingling and numbness in the chin and lips as the implant heals. This is normal and can remain for several months after surgery as the facial nerves become accustomed to the new implant. Patients describe post-operative pain as relatively mild and easily treated with pain medication. Antibiotics may be prescribed during the healing phase to avoid infection. If the implant was placed through an incision inside the mouth, the stitches will dissolve on their own in a few weeks time. For under-the-chin incision sites, the sutures will be removed four days to one week after surgery. Benefits and Options Multiple options are available in the area of chin augmentation. To achieve the best results it is recommended that patients explore all options with their surgeon to decide which procedure will best deliver the desired results. There are several benefits associated with chin implant surgery. For patients who have used temporary fillers as a means of chin augmentation, implant surgery offers a more permanent solution. Chin implants are also created in a variety of sizes and shapes allowing patients several options. Patients and doctors are also able to have flexibility in determining incision site, either inside the mouth or under the chin. Finally, chin augmentation is easily performed in conjunction with other procedures such as chin and neck liposuction or rhinoplasty. As with all surgical procedures, chin implant surgery does carry some risk. It is important for patients to take special care after surgery. One of the main risks is post-operative infection. While most patients respond well to antibiotics, some do not. In these cases, the implant may need to be removed in order to successfully treat the infection. In addition, a chin implant can shift during the healing process. So, it is important for patients to leave wraps and dressings in place, unless advised by a doctor, and avoid heavy activity or contact sports. It is also possible for sensation to the chin to change after chin implant surgery. The average cost of a chin implant procedure in the United States is approximately $4000. This cost can vary by location. Any additional procedures – such as chin and neck liposuction – performed at the same time will raise the cost. The first step to achieving the desired results from chin implant surgery begins with finding the right surgeon. The surgeon’s background and experience are very important. Surgeons should be highly trained and board certified. Miami plastic surgeon Dr. Jhonny Salomon is Board Certified by the American Board of Plastic and Reconstructive Surgery and has over a dozen years of plastic surgery experience. He is also a member of many professional organizations including the American Society of Plastic Surgeons and the Greater Miami Society of Plastic Surgeons.